Over time, it led to hurdling and as her love for the obstacle event deepened, so did the preparation and performances that have now earned her global recognition as the bronze medal winner in the women’s 100m hurdles at the 2018 Youth Olympic Games. “I feel great. I don’t regret it; I really don’t. 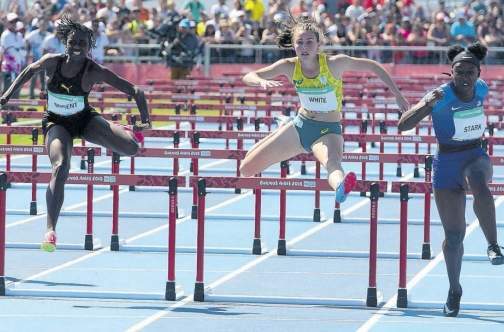 I hope further on in the future I’ll be one of the best hurdlers,” Nugent rejoiced among a cacophony of feelings. Nugent (26.41) finished second in the ‘final’ with the second-fastest time, a wind-aided (2.80mps) 12.96 seconds. But combined with her Stage One clocking of 13.45 seconds — after slowing considerably over the last two hurdles with a big lead on her rivals — she placed third overall, missing silver by one-hundredth of a second. “It’s a bad strain. I was lucky I didn’t have my foot broken, but I’ll be fine,” she admitted. In a sense it appears the athlete felt duty-bound to deliver a worthy performance, having given the reply in a Vote of thanks at the Athletes’ Village to Jamaica Olympic Association (JOA) President Christopher Samuda’s battle cry, on the eve of their Games outing. Samuda said: “Our context is victory for country, and more importantly victory for self — belief in self, belief in your potential, belief in your ability. We already have the raw material. Most of you have gone to Champs, if not all of you, and have competed in national events on the way here, so you have the pedigree already. It’s in you already. “You just have to express it now and when you express it, express it with a sense of humility by shaking the other person’s hand. Always express goodwill … for at the end of the day all of us are human. We may not win the gold medal as victors, [but you’re] victors in life, victors just by being here,” inspired Samuda. Head coach of the Jamaica team, David Riley reflected on Nugent’s winning mentality. Riley is also head of Excelsior High’s track and field programme, but he quickly assigns credit to Douglas Williams and Michael Forrest for Nugent’s advances, because “they’re the ones who interface and develop her on a daily basis”. “It’s not sheer talent. I have a passion towards the event that I compete in [so] that it becomes an extra-curricular activity at school. I got gravitated to this and now I’m dedicated to it,” explains Nugent. “This is a big opportunity, whereby I’ve proven myself that I’m worth more than I actually expect of myself, as well as every disappointment becomes an appointment,” she expressed, latterly referencing not being available for the medal ceremony as she had been receiving treatment in a nearby medical facility for the injury she suffered.